The Ewoks are the most realistic part of Star Wars. There. I said it. You don’t have to believe me or agree with me, but hear me out. I constantly hear fans bashing the Ewoks as the forced cuteness that “ruined Star Wars” before the prequels had a chance to underwhelm audiences everywhere. Yes, Star Wars is fantasy, not science fiction: There are wizards, magic swords, evil lords, and a prophecy yet to be fulfilled. But by setting it in a galaxy, far, far away, the films seem like science fiction. 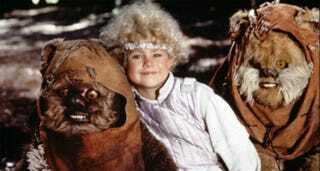 Science fiction is all about making the fantastic seem real, and Ewoks are the most real part of Star Wars. For the record, I’m only considering the six existing films – there were likely tons of interesting and believable aliens in Clone Wars or the previous Expanded Universe, but let’s focus on what most general audiences are familiar with. You know Luke, and Amidala, and Rey are all aliens, right? I mean, the look human, they act human, they dress human, and they’re even called humans, but they are not of this Earth. What are the odds that billions (or just thousands?) of years ago in a far away galaxy, humans evolved to appear exactly as we do now, with clothing, mannerisms, and mores that match the way we think we are? Sure, some anthrocentric scientists think that’s the probable way intelligent species would evolve, but still. And the ones that aren’t human, are just humans-plus: humans with primary-colored skin, or fur, or antennae, or a bumpy forehead. Okay, ignoring the ones who are not obviously human, let’s look some other races. Try to imagine any situation in which the dominant species on a planet is a several-ton slug that is sexually attracted to bipedal simians? Oh for that matter, how a giant stationary carnivorous creature can survive in the middle of a dessert, even if it digests meals over thousands of years? Come to think of it, what’s up with thattwo-headed, two-languaged announcer? You know what? Everyone on Tattooine is suspect. Let’s not even get into Hammerhead. Okay, for the sake of argument, let’s say plant life was to evolve similarly to that of Earth and that four-limbed vertebrates were the dominant life form. A humanoid species could develop, as that just makes sense for manipulating tools, climbing trees, running from danger, and raising young. Plus, it’s not like they’d walk on their hands and grab things with their feet, right? That’s just silly. But the Ewoks don’t just look like humans. They are humanoid, sure, but they’re also ursine, simioid, and in general, mammalian. Makes sense for a dense forest. Not enough sun for most repiloids. I realize that term “modern” is loaded, but to be blunt, you rarely see a humanoid race in live-action science fiction that isn’t dressed in a way acceptable to modern first world society. Heck, in the 1960s, aliens couldn’t even show their belly buttons without breaking taboos. But look at the Ewoks. They wear head coverings, but this doesn’t seem to provide any practical value, so it must be for some religious or social reason – perhaps a cultural taboo of their own. They wear various ornaments, many likely the spoils of previous kills. They possess technology similar to humans, but then spears and ropes are common throughout cultures on Earth, and do not seem unlikely things to be invented by a progressing civilization. Ewoks eat people. There, I said it. The long-running joke is that the Ewoks tried to eat Luke and Han and later we saw the helmets of fallen Stormtroopers, so clearly the Ewoks ate them. And what of it? Yoda seems as non-human as the Ewoks at this point, but he still acts fundamentally human. Sure, his grammar is unique, but he dresses human and he behaves in ways that make him acceptable to modern human civilization. The Ewoks don’t and they don’t care. Furthermore, unlike every other race in the universe, they couldn’t give a bantha’s poodoo about the fight between the Empire and the Rebellion. First, they only protected their own territory, then they teamed up with whoever their god suggested they team up with. Oh yeah, and they worship 3PO. Sure, aliens mistaking humans for gods is a common trope in sci-fi, but in the Star Wars universe (at least in the films), you either believe in the Force or you don’t. The Ewoks, on the other hand, have a specific and defined theology that is unrelated to anything other species concoct. This is significant because while many of the species in Star Trek have unbelievably monolithic cultures, in Star Wars cultures are shared by dozens of planets at a time. This one tribe of Ewoks, on the other hand, have their own culture and a Golden God and they fervently believe in his word. Yeah, an Ewok is the only ancillary character whose death appears meaningfully on screen in the original trilogy. We see an Ewok die. We see his friend morn him. We see fear in the eyes of other Ewoks when death is possible. Sure, in theory, all other races likewise fear death, but how often in Star Wars, or a lot of filmed speculative fiction for that matter, do the deaths of background characters get the time of day? Heck, Clark Kent’s graduating class in Smallville had a higher mortality rate than most major cities, yet the teens only attended like one or two funerals because they just didn’t care. Similarly, the Gungans fought to the death to defend a people they never met or cared about until someone asked them to please help, but none of them seemed to fear death or care if they died (although Jar Jar may have simply realized he was in no danger). In that tragic moment, those two Ewoks showed more emotion than most of the major characters in Star Wars. A lot is made of teddy bears defeating the Galactic Empire – but that isn’t what happened. It was years of Rebel successes that slowly whittled down the core power of the Empire, and it was Rebel forces that defeated the Empire stronghold on the Forest Moon of Endor. However, the Ewoks did give the Stormtroopers a run for their money. From the 20th century onward, it’s become clear that guerilla forces – even if they don’t have the technology of their opponents and especially if they have familiarity with the terrain – are a threat to larger, more apparently advanced military might. It was no different for the Ewoks, who were a complete unknown to the Imperial army. The Empire’s forces were expecting and preparing for Rebel troops, they never even considered the potential threat of small, naked animals in the trees with surprisingly effective wood-based weapons. So you’re thinking, if the Ewoks seem realistic, shouldn’t the same apply to Wookies? Yeah, they have similar homes, clothing styles, and family environments, but here’s the thing: Wookies are cartoon characters. Wookies speak in guttural grunts, yet many characters understand them as if they were speaking basic human language. Now it’s possible for people to understand such a simple language, it does stretch the limits of plausibility when Wookies sound more like giant dogs than other humans. Wookies, if they are accepted parts of galactic society, should dress like other people in the galaxy. Look at the world today: no matter what country you visit, if there are cell phones and cars, men go to high-level jobs wearing suits and ties. By not conforming to the majority, the Wookies may be showing cultural fortitude, but it seems extremely unlikely at least some wouldn’t put on pants. For that matter, Wookies are completely adept at all human technology and techniques. They can fix things, interact meaningfully with society, and form friendships with humans. They even have clearly advanced technology that for no reason other than aesthetics, look like archaic crossbows and gyrocopters. It’s almost as if the family dog stood up and learned to fix the car. For all the knocks they get for ruining the original films, the Ewoks still seem like a race and culture that could evolve another planet. They were a realistic threat to the Empire. And they were the most authentic part of a galaxy far, far away. Kevin Garcia is a professional educator and freelance writer whose work has appeared in Marvel Comics, the Associated Press and on various blogs. He manages Monomythic.com, where this post originated on Dec. 6, 2015. Follow the blog at www.facebook.com/monomythic/!